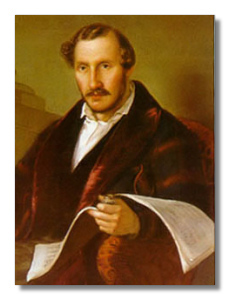 Gaetano Donizetti (November 29, 1797 - April 8, 1848) was born in Bergamo, a small town in northern Italy. He began his early musical education under several teachers, including the famous opera composer Simon Mayr, and later, in Bologna, under the renowned teacher Padre Stanislao Mattei. Donizetti's father insisted that his son return to Bergamo and support himself by giving music lessons, but Gaetano disliked the life of a music teacher and decided to enlist in the army. While stationed with his regiment in Venice, Donizetti found time for composition; his first opera, Enrico, Conte di Borgogna, had a successful premiere in 1818. His second opera, Zoraide de Granata (1822), was so well received that Donizetti was discharged from the army and exempted from any further military service so that he could devote himself completely to music. During the years 1822-28 he produced a string of successful operas, most notably comedies in the classical style of Gioachino Rossini, but these works are seldom heard today. The Romantic influence of Vincenzo Bellini is evident in Donizetti's next operas, the most famous of which is Elisabetta al Castello di Kenilworth (1829). In 1830, Donizetti reached his artistic maturity with Anna Bolena, and his international reputation was established. Anna, like a good many of the composer's works, is a romanticized version of English history. Cherished by the world's leading dramatic coloratura sopranos, the opera provides an opportunity for the ultimate display of vocal and histrionic skills. Two years after Anna Bolena, L'Elisir d'Amore (The Elixir of Love) scored a success in Milan. This sentimental pastoral comedy contains many beautiful melodies, and is one of the composer's most frequently performed works. In quick succession, Donizetti produced a series of notable operas: Il Furioso all'Isola di San Domingo (1833), Lucrezia Borgia (1833), and Maria Stuarda (1834) are the best known of these. The year 1835 was one of failure abroad and acclaim at home. While his Marino Faliero was not well received by Parisian audiences, Donizetti triumphed in Naples with Lucia di Lammermoor. Perhaps the composer's most popular work, Lucia is a mixture of Romantic melodrama and Rossinian floridness. Coloratura sopranos delight in the pyrotechnics of the "Mad Scene", while the second-act sextet is certainly an example of Donizetti at his best. Another of Donizetti's operas that is still performed today is Roberto Devereux, composed in 1837 – the role of Queen Elizabeth is one of the greatest dramatic challenges for a coloratura soprano in all of opera. Several years later, the composer had a run-in with Italy's political censors, so he traveled to Paris, where La Fille du Régiment (The Daughter of the Regiment) and La Favorite (completed in 1840) were well received; the former, though sung in French, is a thoroughly Italian comedy, while the latter is a typical example of French grand opera. For Vienna, the composer then wrote Linda di Chamounix (1842) and Maria di Rohan (1843). Linda, the better known of the two, is an opera semiseria, combining comedy, romance, and pathos. Donizetti's early operas were often written to accommodate the talents of a particular singer, with pages of purely vocalistic writing that severely hampered the drama. As he matured, however the composer's dramatic instincts began to take precedence over sheer vocal display. By the time he completed his last well-known opera, Don Pasquale (1843), his mastery of the drama was complete; this bubbly, brittle comedy ranks as one of the greatest examples of opera buffa ever written. The death of his wife in 1837 was a blow from which Donizetti never recovered. He battled frequent bouts of depression and insanity, and in 1845 he suffered a stroke that left him completely paralyzed. Death came as a welcome relief on April 8, 1848. Italy, as well as the entire musical world, mourned the loss of this gentle, even-tempered man and gifted musician. Donizetti was an astoundingly prolific composer. In a little over twenty-five years he produced more than seventy operas, twelve string quartets, seven masses, songs, piano music, motets, cantatas, and psalms. The speed with which he worked was legendary: L'Elisir d'Amore, for example, was composed in the incredibly short period of eight days. Because of his extreme haste, Donizetti's work occasionally suffers from inconsistency, feeble orchestration, and superficiality. His melodic genius and bouncy good spirits, however, are always in evidence. Donizetti also played an invaluable role in the development of Italian opera, planting the seeds that enabled opera to flourish in the latter half of the nineteenth century. Donizetti, to a much greater extent than Rossini and Bellini, was to exert a tremendous influence on the operas of Giuseppe Verdi. The composer, though, will always be best remembered for the rich musical catalogue of his own works; L'Elisir d'Amore, Lucia di Lammermoor, La Fille du Régiment, and Don Pasquale have never left the opera house, and the recently renewed interest in music of the bel canto period has led opera companies to bring new life to many of his other stage works.